There are many ways a new ticket can be created automatically. These include via email, the Customer Hub, a CRM integration, and from our API. 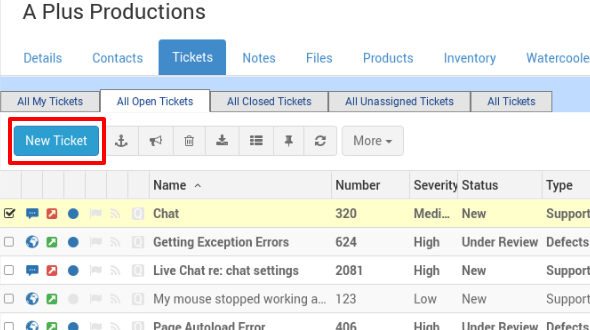 You can also create a ticket manually by clicking on one of the following New Ticket buttons. If you click the New Ticket button while you have a Company or Contact selected, they will be associated with the ticket. First click open the Customer from the Customer section, then click on the Tickets tab. The only default required field is Ticket Name. If you would like the ticket to be visible to the customer associated with the ticket, check the “Visible” box. Otherwise, leave it blank and only TeamSupport users will be able to see the ticket. I created my first ticket! What’s Next? Click here for more details on creating a ticket.